New matching grants to empower women: why and how? A strong society needs gender equality. Empowering girls and women moves mountains. World leaders, field experts, and scholars alike agree that it’s the key to unlocking economic growth, political stability, and social transformation. We're thrilled to announce a new matching grant initiative: Building & Strengthening the Impact Entrepreneurship Ecosystem in Israel. This initiative is a collaboration between the Edmond de Rothschild Foundation (Israel) and Jewish Funders Network. 22 projects will receive matching funds from the Breaking Barriers matching grant initiative in honor of 2016 Genesis Prize laureate Itzhak Perlman. JFN Matching Grants Initiatives are an innovative strategy to grow the base of significant funders for a given field of Jewish philanthropy. Sponsoring a matching grant initiative increases the pool of philanthropic supporters for that field. JFN Matching Grant Initiatives leverage the sponsor's funds to encourage new donors to make their first ever (or significantly increased) grants to a specific field by offering matching funds directly to the organization that the new donors’ funding will support. Because new donors choose the specific organization within broad funding parameters, donors who participate understand that the matching funds are indisputably new money, entirely contingent upon the gifts they decide to make. At the same time by requiring that eligible donors be making their first ever (or significantly increased) gifts, the initiatives offer the sponsoring foundation the security that their gifts are genuinely generating new funds from the individual donors. Sponsoring a matching grant initiative is a benefit of JFN membership. Are broad enough to allow donors to choose the organizations they feel connected to, but narrow enough to control the scope. A minimum of 50 qualified organizations is recommended. Have clear parameters and defined criteria both for eligible donors and eligible organizations. Work in fields with enough capacity to raise and utilize the funds. Successful matching grant initiatives do not place complicated requirements on a field that does not have the capacity to implement them. A 2018–2019 matching grant funded by the Genesis Prize Foundation, generating $2.67 million in funds. A 2018–2019 matching grant funded by the Edmond de Rothschild Foundation (Israel). A 2017-2018 matching grant funded by the Ben & Esther Rosenbloom Foundation, generating $3.85 million in funds to 14 projects. Breaking Barriers (2016-2017) was funded by the Genesis Prize Foundation, generating $3.17 million in funds to 22 projects. Avenues to Jewish Engagement for Intermarried Couples and their Families in honor of 2015 Genesis Prize Laureate Michael Douglas (2015-2016) was funded by the Genesis Prize Foundation, generating $3.3 million in funds from 50 funders to 28 projects. This 2013-14 matching grant, funded by the Weinberg Foundation, generated more than $9 million in funds from 61 donors to 30 grantees. This 2013-14 matching grant, funded by the Nathan Cummings Foundation and others, generated more than $2 million in funds from 37 donors to 30 grantees. This 2013-14 matching grant, funded by the Leichtag Foundation, generated more than $2 million in funds from 31 donors to 26 grantees. This 2012-13 matching grant, funded by the AVI CHAI Foundation and Kohelet, generated close to $10 million in funds from 199 donors to 119 grantees. These matching grants funded by the AVI CHAI Foundation and UJA-Federation of New York in 2010 and 2012, generated $4.5 million in funds from 92 donors to 63 grantees. This 2009 matching grant funded by the Richard & Rhoda Goldman Fund, generated $1.5 million in funds from 23 donors to 13 grantees. This 2008-09 matching grant funded anonymously, generated $1.7 million in funds from 23 donors to 17 grantees. This 2007-08 matching grant, funded by a consortium, generated more than $9 million in funds from 199 donors to 147 grantees. This 2007-08 matching grant, funded by the Foundation for Jewish Camp, generated $2.1 million in funds from 30 donors to 19 grantees. This 2006-07 matching grant, funded by the Weinberg Foundation, generated $6.6 million in funds from 84 donors to 55 grantees. These matching grants funded by the Rashi Foundation in 2005-2007 generated $4 million in funds from 53 donors to 23 grantees. This 2005-06 matching grant, funded by a consortium, generated $26 million in funds from 296 donors to 167 grantees. This 2004 matching grant funded by the AVI CHAI Foundation generated $7.2 million in funds from 89 donors to 65 grantees. Seven foundations match pledges from JFN Members to pursue human rights, sustainable agriculture, and economic and social justice projects. NEW YORK, January 2, 2014 -- An artists’ project, a dance company, and an NGO that uses film to promote nonviolence among Israelis and Palestinians are among the grantees from the first round of a matching grant program devoted to furthering social and cultural programs in Jerusalem. 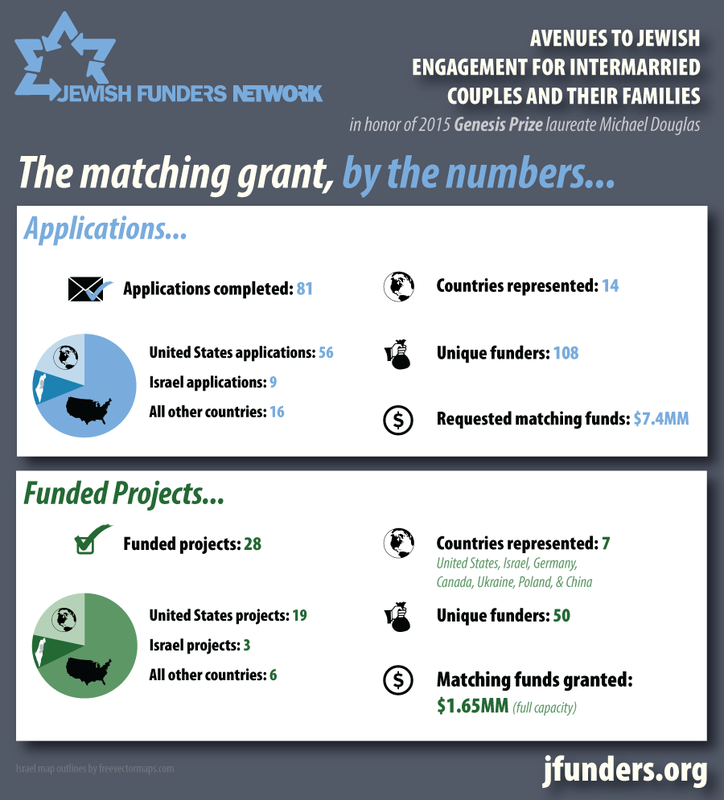 MATCH 4 is a matching grants program funded by the AVI CHAI and Kohelet Foundations in partnership with Jewish Funders Network (JFN) and the Partnership for Excellence in Jewish Education (PEJE). MATCH 4 provides a 1:2 (50 cents on the dollar) match for new or significantly increased gifts to Jewish day schools. MATCH 4 grants are capped at a maximum of $50,000 per school.